Art Knapp's Surrey Garden Store carries hard to find, novelty, and retro candies in vintage style boxes, including English candies and crisps direct from England from companies like Walkers, and unique candies from around the world, including exclusive lines of German candies. For a truly memorable drink, drop by and try a unique crafted drink like Huckleberry Soda, Butterscotch Root Beer, or Birch Beer. 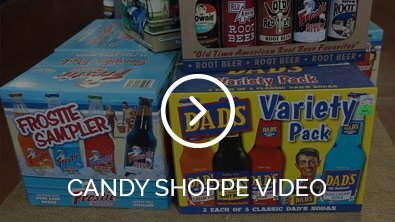 We have a huge selection of pops, sodas and other fizzy drinks heralding from an era when your grandpa drank them. Our shelves are stocked full with goodies from Rj’s, Jaffa Cakes, Pucker Powder, Dan D Pak and many more producers of high end sweets. And for a sweet treat directly from local producers to you, check out a full range of healthy organic honey products made from bees that may have even stopped by your garden - and are seen frequenting around the blooms in our Garden Spot.